It happens to all of us sooner or later. Eventually, you're going to get wind of the mysterious wonder known as a "Sheep and Wool" festival and the primitive knitter/spinner center of your brain is going to perk up and take notice. Maybe you decide to go because a friend is a spinner. Maybe you're thinking about being a spinner yourself. Maybe you go because you're a knitter and you hear that there's a lot of yarn there. Whatever lands you at your first fiber Festival, I guarantee it won't be what you expected. One minute you're asking yourself why you're driving to a spinning event when you don't really spin (or don't spin much, certainly not enough to justify a whole Saturday and the gas money) and the next thing you know you're staggering around some field far from your house with a bunch of other fiber types, hundreds of sheep, alpacas that look at you funny, a credit card and the definite feeling that something serious is about to go down. It's our instincts as knitters and spinners that drives us to the fiber festival, the traditional gathering place of our people, but you've got to be wondering what's going to happen and what you're supposed to do when you get there. Having walked out of one or two of them with a blackout, a badly damaged credit rating and a car full of fiber that I don't really remember buying, I've put together the following tips for Fiber Festival survival.
" That spindle is going to be wonderful for silk"
"This fleece is too full of s**t to be worth it." "Margaret, you guard this while I get the wheelbarrow." Once you identify this person, you can either befriend them or follow them at a distance. (Hint: Spinners aren't usually offended by this variation on stalking, but you will learn more if you go talk to them. They really do want to discuss their favourite fiber with you and they would be nothing short of thrilled to corrupt you into your first spinning wheel or fleece.) There exists at every fiber festival a contingent of spinners who have only come so that they can show you the good stuff, teach you what to do with the spindle you just bought and help you buy more. Colloquially referred to as "enablers" these experienced spinners can be identified when you hear them use the phrase "Here, touch this..." 15 times in as many minutes. Trust these spinners. The force is strong with them. If you are an animal lover looking forward to meeting all of your favourite fiber-bearing animals, you are in for a treat. These festivals are a neat chance to find out how big angora bunnies are, how cute alpacas can be, how many wrinkles there are on a merino and how devastatingly clever sheep dogs are as they go about their work. There is also the festival tradition of cooking lamb-burgers (in plain view of the lambs) so if you're a vegetarian (or you just think that it's odd to watch the barbeque smoke drift over the barns full of sheep) you might want to avert your eyes and pack a sandwich from home. Buy the best that you can afford. Don't fall for the newbie idea of not buying something wonderful because you aren't good enough to manage it, or the even worse idea of using crap because you'll only wreck it anyway. Learning a new skill is challenging enough without being further challenged by lousy tools and fiber. One of the first things I ever spun was 100% angora, and it was fine. It was months before someone told me that beginners can't spin that fiber and that it was impossible for me to start there. (By then I'd turned it into bootees. Everyone is different.) If you buy nothing else, get one really good drop spindle (there will be a hundred people to show you how to use it) and a fiber that you really, really love. Having beautiful things is inspiring. It'll give you something to live up to. If you're just learning, try getting small amounts of a lot of different fibers. Goodie bags with tastes of rare fibers, a single silk hankie, a handful of cotton...one bump of merino, 20g of mohair. Take them all on a test drive sitting under a tree and go back and get more of what you like. If you feel overwhelmed and find that you're buying...well, everything, try my festival rule. Before I can buy something, I need to want it for 20 minutes. 20 consecutive minutes. 20 minutes where I don't get distracted by something else, don't decide I'd rather get a coffee or wonder if there's something better in the next barn. 20 minutes. You'd be surprised how much that takes the edge off of the impulse buying. Try something new. Spin on a great wheel. Comb angora from a rabbit. Ask a vendor if you can try a top whorl and a bottom whorl spindle. Ask them why they have both. Ask for locks (samples) of fleeces that you think are interesting, and put them in envelopes to examine at home. (Make a note about what they are. You won't remember later.) Talk to people. Watch a shearing. Find out about more about the world of spinning -- there's a lot of information in one place at these things. Fiber festivals are like a good yarn shop. It's about the people. Finally, a word about safety. These things can get competitive. Remember that for some of these fiber enthusiasts, this is an opportunity to get a year's worth of the stuff they crave all at once. They are hopped up on wool fumes (you might be too) and when the roving goes on sale for 50% off...things can get ugly. If you find yourself in the middle of a yarn run...stand tall, don't lose your ground and don't let go of the sale sock yarn in your left hand. Stay with a buddy, and if the going gets really rough in there, drop the fiber and hit the ground running. There's no wool worth an injury to your knitting hand. Good luck, and if you see me by the fleece judging, stop and say hi. Just don't get between me and the fiber. I'm looking for a nice Montadale. Stephanie Pearl-McPhee lives, knits, spins and writes in Toronto, Canada, where she avoids housework and dreams of fiber festivals. 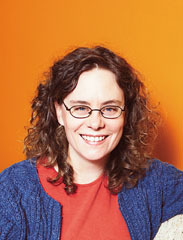 She is the author of "At Knit's End", "Yarn Harlot", "Knitting Rules" and her pet blog.